Good personal finance comes from fantastic organisation, a sprinkle of discipline and of course following the golden rule: spending less than you earn. But you don’t want good personal finance do you? You want financial success! You’re a well oiled, number crunching finance guru on the hunt for opportunities that would make the bank’s savings rates quiver. 1. What Expenses Should I Budget for This Month? If you haven’t done so already, make a budget! Before the start of the month you should have a pretty good idea of what will be left at the end of it. Your budget should include your regular expenses such as groceries, rent and gas but should also consider any other irregular expenses for that month. The worst thing that can happen to a thrifty finance guru like you is getting hit with an unexpected expense to flip that budget on its head! But being a lean mean finance machine, you’re of course going to be prepared for this. You’ll be using an essential tool; the diary. Are there any special dates or events that you’ll need to be prepared for in the coming month? Spouse’s birthday? Easter? A work party? Time to renew your website hosting? Maybe it’s coming to that point where your quarterly electricity bill is due; plan ahead and be prepared for it. 2. What Steps Can I Take to Increase my Income? Do you have a business or a side-hustle? Then you’ll have potential customers out there, 1000s of them – you just haven’t met them yet. Find out where they are and how you can get in touch with them. It’s far too common to focus so much on detail that you forget about your sales process so be disciplined and get selling! The truth is, we’re all super busy; we all have an endless to-do list and there’s only so many hours in a day. But take a look at that to-do list and be ruthless; which of the items on your list will directly contribute to increasing your income? If the answer is none, it may be time for you to write a new list. Brian Tracy can’t stress this idea enough; successful people focus on doing much more of the important tasks! 3. How Can I Reduce My Expenses? With inflation, rising incomes and all of those wonderful subscription services out there it’s natural for your expenses to gradually increase over time. But you’re a finance savvy investor and you’re not going to settle for that; you should always be looking for ways to cut down your personal/business expenses where appropriate. Get on the phone to your utility companies and see what they can do to cut your costs (Editor’s note: old O2 customers can get broadband with Sky for as low as £5 per month!). Look at your budget for the month and decide if there’s anything you can realistically cut down on; if you really fancy getting frugal, Mr. CBB has a fantastic grocery shopping challenge that you can take on to reduce your food bill. Take a look at your monthly subscriptions and decide if you still want and need them. After all, it’s not how much you earn that makes you successful, it’s how much you keep! 4. How Much Money will my Money Make? Asset allocation is crucial to ensuring your savings/investments give you the greatest returns. To ensure your money is working hard enough, you need to be looking at two elements; where you keep it and how you spend it. Current accounts – Unless your account provides high interest like the Santander 123 account consider only keeping what you’ll need for the month in your current account and placing the rest of your capital in savings, emergency funds or investments. Emergency Fund – A key trait of an emergency fund is that it should be easy-access but this will most likely lower your potential rate of return. Although the emergency fund is a very important buffer you shouldn’t let it swell. Decide how much you will need in there and anything above that should be reallocated to higher return investments. Try to work out the cash value of your monthly returns as you never know when an opportunity could come along that could give you a larger of faster rate of return. Knowing the average cash value of your return will allow you to weigh up any potential opportunities. Shopping Smart – If you’re going to spend money then you may as well be rewarded for it! Consider where you spend large portions of your money; buy in bulk, use coupons and gain loyalty points such as Clubcard/Nectar. Credit Cards – Some credit cards provide a massive 5% return on your spending which costs you nothing providing you pay off your card in full at the end of each month. There’s a number of ways you can benefit from your spending; get creative! 5. What are my goals for the month? Ever heard the expression; failing to plan is planning to fail? This is all too true; you can’t expect to improve your finances if you haven’t worked out where you are going and where you want to be! Lay out your plan and work out how you’re going to get there. Set realistic goals and remind yourself of them every day – the more you think about them the more likely it is you’ll take action! These are some questions I’ve been asking myself over the past few months; stop by the Budget Breakaway Blog to read more about how they’ve worked for me! This post was featured on the Money Misfit, Frugal Rules, thank you! Those are excellent questions! I’m working hard on #2 and #3. We’re currently preparing for the re-launch of my brother-in-law’s website in May. This should bring in a nice chunk of cash (not over-charging but still getting paid reasonably for the work I’m doing). And we’ve decided to rent out one room in our 3 room flat. Munich is the most expensive city in Germany and people are very desperate for living space. It’s mad. They’re paying up to 600€ for 10m²… This will reduce our monthly expenses (living costs) to 350€ per person. Looks like you have some great plans in the works; all leading up to a very successful year for you. You are absolutely right. Every person want to maintain their own financial matter as per their own way. In between monthly Income and expenditure, saving is a big thing for all of us. Those who are fresher in working field obviously all type of questions you mentioned in your article stay in mind whole month. Once you started doing good income the frequency slow down little bit. Few year ego when I started to use credit card that time I face some problem regarding payment. So credit card question also make irritate few persons I think. [email protected] Education recently posted..How Do I Break-free From Cash Crisis? Hey James, thanks for stopping by! Yes, it seems to be the main part of our expenditure that has fluctuated the most! One slightly expensive meal choice can amount to five budget meals – planning before shopping is essential. We love reading how you’ve got on in your grocery challenge! Thanks for stopping by Mr. CBB! I always ask myself most of these questions. I want to know if I can save on this or that, but I really want to know how much I can make this month. That is a plus for me. Asking yourself how much you can make in a month is inspiring as it forces you to think of new ideas and take action – fantastic question. Thanks for stopping by Grayson! Great questions to ask yourself each month! It is easy to mindlessly spend money without consideration to where that money is going. 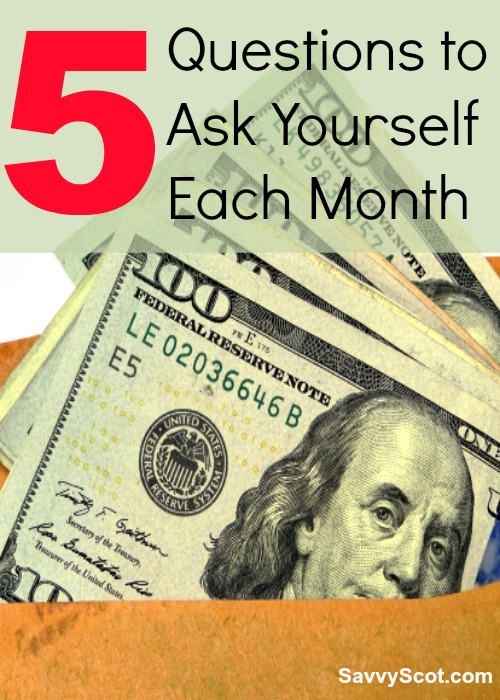 These questions help you readjust your budget as your needs change each month, even if it is only a slight change. You can always look to reduce expenses, whether it’s eating out less or canceling magazine subscriptions. It’s also very important to assess what your goals are and how much money you do need (or will need) to afford to reach them. Goals are sooooo important! Life is so busy for everybody nowdays so it’s important to give yourself some direction and go where YOU want to go; otherwise life will take you off somewhere else! I’m trying to have a budget each month, I use mobile application to track my expenses. And every time I go to groceries, I make sure that I bring my loyalty card with me so that I can earn more points and even convert it into a cash. Marie @ My Personal Finance Journey recently posted..Is Supplemental Health Insurance Worth Having? Nice work, can I ask which mobile app you use? The grocery experience has become quite a game for us recently: money off vouchers, coupons, loyalty points, ‘bring your own bag’ bonuses, and credit card bonuses – all in one shop! Great list of questions. Things are a bit jumbled, budget-wise, for me lately because of my upcoming wedding and honeymoon. I will budget and then completely forget about this expense or that expense. I really need to focus and write everything down as I think of them, and keep an ever changing budget right now so that I know I am on track. Otherwise it’s so difficult. Daisy recently posted..Dear Nora: How Do I Manage Finances While Travelling Long-Term? I bet the wedding costs are really difficult to budget for; lots to take into account! You have a fantastic guide about this money questions. It’s really useful and helpful. Glad to read your article. Thanks for sharing it. Great post! This is something I do every month and thanks to that I manage to save money and do something productive with the money. Good overview that will help most avoid preventable financial problems … now if only more ppl would implement it!